Yes, I know, that is hardly the way to start a diary entry. However, I can assure you it wasn't a very good way to celebrate a Saturday afternoon either. We had just gotten back from the AAU National Qualifier in Addison. It had been an exciting morning at a qualifier for the Tae Kwon Do National Championships. But, the results will have to wait until tomorrow. None the less, Graham and Sydney were playing inside. Lynley and I were on the back porch putting together a grocery list and Ainsley was about 25 feet away swinging on the tree swing. Even though Lynley and I were working diligently, we had a pretty good eye on Ainsley. Honestly, we had little choice. On every upswing Ainsley would call out "Mommy (or Daddy) watch this!" Next, we saw her swing down, we heard the sound of a melon crack, and we saw the swing come back up without her on it. All of a sudden she burst out screaming. Lynley and I were already running down the stairs from the porch. By the time we were half way there we could see the blood on her dress. That was fast. Where is the blood coming from? Ainsley stood up. The back of her head was soaked in blood and, I kid you not, there was a stream of blood literally shooting from the back of her head. 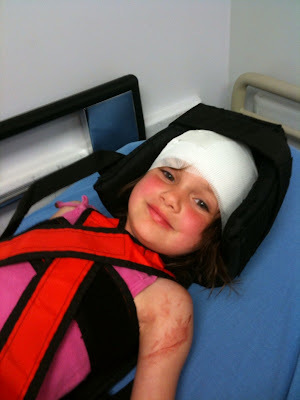 Lynley stabilized her and her head to keep her from moving. I shot back up the stairs to grab towels and the phone to call 911. Within seconds, I was back with a towel. It took less than a minute for the first one to soak through with blood. I got her another one and Lynley increased pressure. Ainsley was awake, alert, and no doubt terrified. Lynley had always told her that if she wasn't more careful she was going to crack her head open and that was Ainsley's first question. "Mommy, did I crack my head open?" As Lynley applied pressure and first aid. I barked orders from the 9-1-1 operator. "Don't move her." "Keep her still." "Apply pressure." While doing this, Graham and Sydney became aware that something was terribly wrong. They started balling and crying. I asked them to go outside and flash down the fire truck and ambulance. We could hear the sirens getting closer. In the meantime, I locked up the dogs and opened all of the doors to provide the fireman and EMT's fast access to the backyard. Within a minute they pulled up. As they prepared I gave them the background. My daughter Ainsley, age 4, fell backwards off the swing onto the dirt. Significant bleeding from the back of her head. She is alert and conscious. She has not passed out. She has not thrown up. There was a flurry of activity. I then went back into the house to make sure Graham and Sydney were okay. I gave them each things to do. Graham go put on your shoes. I will be up for you in a minute. "Honey, I don't know but she is awake and talking. That is a good sign. Say a prayer for her and lets let the emergency workers do their job." I gathered up everything I thought we would need at the hospital. I called my mother to see if she could come watch the kids. I went back to check on Ainsley and give her a reassuring smile. The EMTs worked methodically and deliberately to slow the bleeding and secure Ainsley's neck and head. Ainsley was scared but she remained responsive and alert. After the bleeding had slowed (or stopped) they wrapped her head tightly and loaded her on the backboard. Then they loaded her on the gurney. As they did this, I went to check on the Graham and Sydney. They were in hysterics. I told them that if they could stop crying and put on a brave face they could go out and see Ainsley. They quickly muffled there cries and I ushered them outside. Ainsley was still obviously scared but I think seeing her brother and sister did everyone a world of good. The kids went back to the house with DeeDee, Lynley went to grab her shoes, and I walked with Ainsley as they rolled her out to the ambulance. 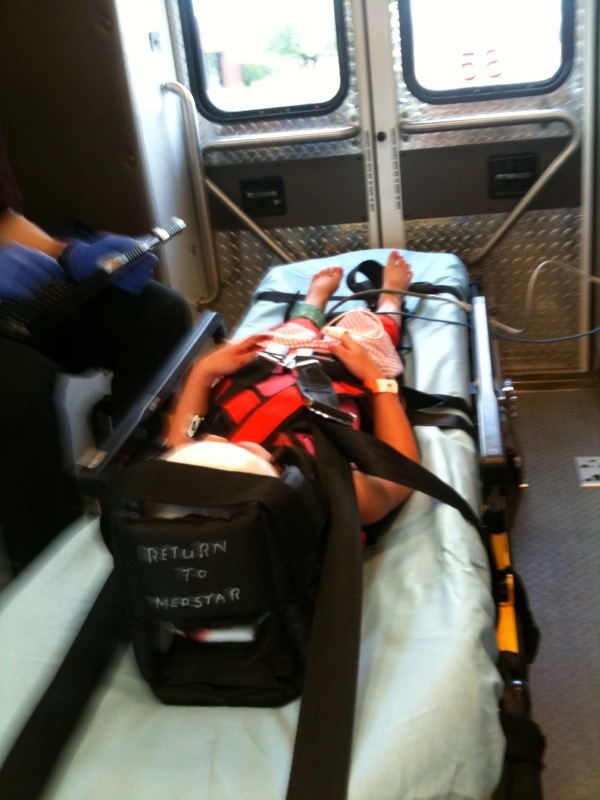 Lynley hopped on the ambulance. I gave Ainsley a kiss good bye and told her I would see her very soon. I grabbed my keys and took off. In fact, I had left the house before the ambulance. On the way, I made phone calls to Mimi and Papa and to a good friend that was a surgeon. I will tell you that I was in shock and could not figure out why there was so much blood. It was good that I had called David. He quickly got me the facts I needed to know and I was then ready to care for Ainsley and my family. Lots of blood was normal - head bleeds profusely (and her case, shoots blood). Injury on the back of the head was better than the sides - skull is tougher. The fact that she was awake and alert was a very good sign. Eyes and pupils responsive was a great sign. No nausea and no vomiting another good sign. The fact that she did not pass out was also a great sign. I felt much better. This could be just a scratch. This could just be some staples in the head and a trip back home. That was the first moment I realized that this might all be okay. I beat the ambulance by about 20 minutes. In the meantime I was texting with Lynley. She was getting more confidence as well. All signs in the ambulance was that this may not be so bad. We would still need and x-ray and maybe a CT scan but this was continuing to look better. They quickly ushered us back into the ER. The only problem was that we found ourselves in the room in which Sydney was diagnosed with neuroblastoma. That left us a little uneasy. However, the fact that Ainsley has doing well and there weren't doctors and nurses swarming all over her gave us some more confidence. In all, it would take several hours. Ainsley would receive several staples to close a 1 centimeter hole in the back of her head but, thankfully, everything else came back good. No fractures and no apparent internal damage. I got my purpose back in one piece. Oh my gosh - so thankful that Ainsley is doing okay. What a headache she must have!! Hope she recovers quickly with no further complications. We had our Relay for Life event yesterday...Sydney's pic is on one of my "why we are walking posters". Our event will raise over $500,000 for the ACS. Wow, what a weekend. Thank God. Now lock them all up and throw away the key. It's all so scary. So very glad to hear you all made it through "another nightmare" with minimal damage. Thanks for including the picture of her smiling with her bandages. Working at the hospital is sometimes trying, but pics like this one make it much more tolerable. Well wishes, prayers and good vibes coming your way, Dungan-fam! So...how is Ainsley feeling? Hope she is recovering from her nasty fall off the swing and doesn't have a lingering headache. Waiting for an update (hint hint)!